Former New York City Mayor suggests Trump plans to pull the U.S. out of the Iran nuclear agreement. Former New York City Mayor Rudy Giuliani, who recently joined President Donald Trump’s legal team dealing with the investigation into Russian interference in the 2016 elections, suggested on Saturday that Trump plans to pull the U.S. out of the Iran nuclear agreement. “We have a president who is tough. 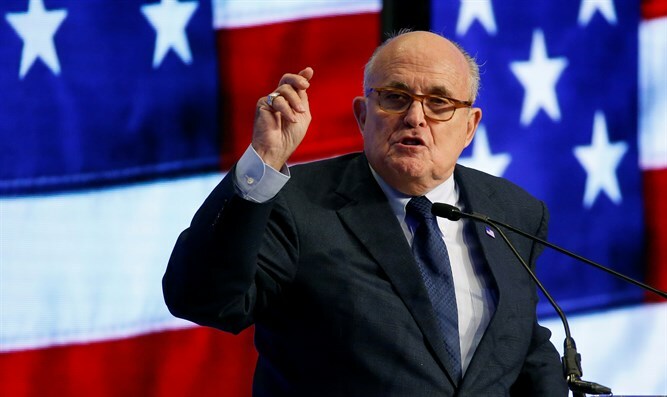 We have a president who is as committed to regime change as we are,” Giuliani said at a conference organized in Washington by the Organization of Iranian-American Communities, according to Bloomberg. “What’s going to happen to that agreement?” Giuliani asked the group before pantomiming spitting on a piece of paper meant to represent the 2015 nuclear accord, drawing raucous cheers. In a conversation with reporters after the speech, Giuliani said he based his comments on the known positions on Iran of Trump, National Security Adviser John Bolton and Secretary of State Mike Pompeo, not on any special information gleaned from within the White House about the administration’s plans. Trump has imposed a May 12 deadline to reimpose sanctions on Iran unless the flaws in the existing agreement are fixed. Pompeo recently said that Trump has not yet made a final decision on the matter but is “unlikely” to stay in the Iran nuclear deal unless it is substantially fixed. Giuliani himself has in the past spoken out against the Iran deal.